The S&P 500 is continuing what seems like an inevitable march towards 3000. Pretty much every indicator I look at is flashing bullish signs (which in actually makes me a little nervous, by the way), and the market continues to grind higher. We’ll likely see a correction in about 4-8 weeks times, but for now it’s full steam ahead and the much focused on level of 3000 is seemingly drawing SPX higher like a magnet. Let’s take a look at a couple of trade ideas on SPX. One of my favorite ones to play a grinding higher market is with a bullish butterfly. 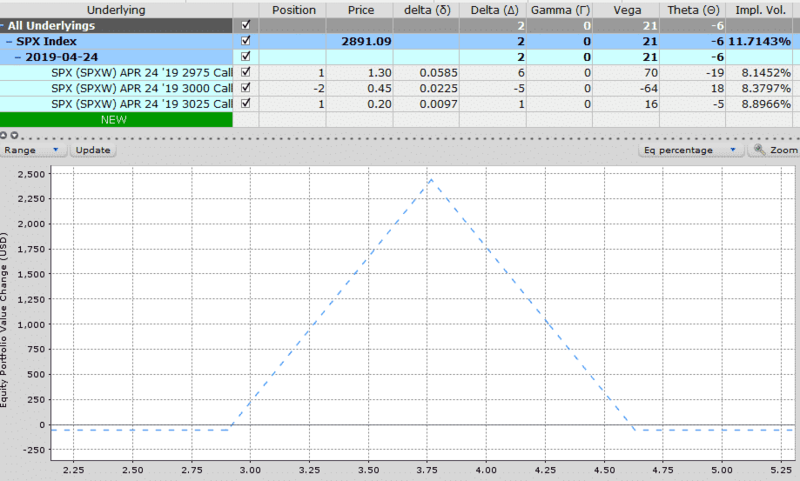 Pick a spot where you think the market might reach by expiration (hello… 3000) and place a butterfly around that strike. This can usually be done pretty inexpensively which means it doesn’t cost you much if you’re wrong. This butterfly can be placed for $200 with a maximum potential gain of $2,300. The zone of profit lies between 3% and 4.6% higher than the current price. Traders who think the move to 3000 might come even sooner than mid-May might try a shorter-dated butterfly. 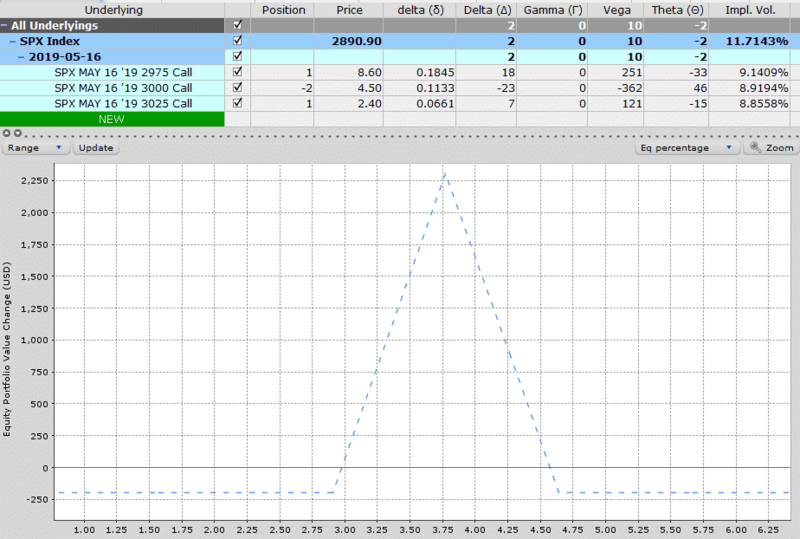 This trade using the April 24th weekly options can be placed for only $60. Now that’s a very cheap way to play a 3% move higher in the next two weeks! This one is more for traders with a large capital base or large holdings of SPY. By writing a call ratio spread on top of your stock holding, traders can gain a nice little bump in profits if SPY moves 4-5% higher at expiry. The downside is that you give up any gains above that level. 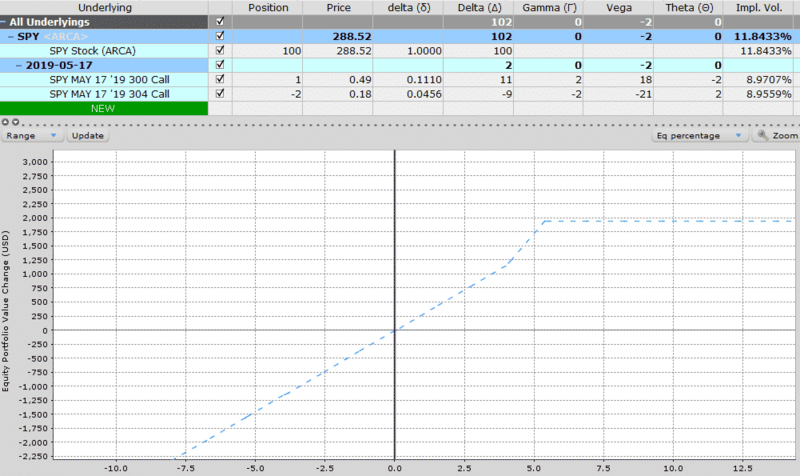 There is a lot more risk on the downside with this one compared to the two butterfly trades.